The late 80s and early 90s in Milan are remembered by the flying Dutchmen, Berlusconi's reign, a steel defense led by Franco Baresi and a golden rain of trophies. There are, however, unsung heroes among the red and black ranks - two of them came from a part of Europe that was at the time torn up by wars, and their countries happened to be on opposite sides. Savicevic and Boban still found a common love for football and contributed to arguably the most beautiful period of Milan's history. The story of Dejan Savicevic begins in Podgorica, the capitol of Montenegro. He began his professional football career at the age of 16, soon growing to be the undisputed leader of local club Buducnost. The club playing in the first league of the great Yugoslavia, consisting of today's Serbia, Croatia, Bosnia, Slovenia, Macedonia and Montenegro. The club, otherwise not very successful, went on to record the best seasons of their history, finally being able to match Serbian and Croatian clubs in terms of talent. In 1988, however, they could no longer hold onto their prized asset and he completed a switch to Red Star Belgrade which would soon become a powerhouse in European football. An unpredictable and technically superb player, Savicevic could play as a support striker, winger or behind strikers. A brilliant dribbler with a surgically precise left foot and a knack for the timely assist, he was a defender's nightmare. Led by the likes of Savicevic, Macedonian striker Darko Pancev, Serbian defender Sinisa Mihajlovic, Croatian Robert Prosinecki and others, Red Star was the epitome of Yugoslavian football at the time. In 1991 they reached their pinnacle, lifting the Champions Cup trophy after defeating Olympique Marseille on penalties in the final, which was played in Bari. The triumph caused a national celebration in the poverty-stricken Serbia which was about to enter the worst couple of years since World War II. Savicevic went on to join Milan for a reported 9.4 million pounds, 600.000 short of the record transfer at the time (Jean-Pierre Papin to Milan, that same summer) and came in second in the Ballon d'Or race that year. In the meanwhile, a different talent was developing in Zagreb, the capitol of Croatia. Zvonimir Boban began his career in Dinamo Zagreb, a heavyweight and usual title contender in former Yugoslavia. He wore the club's trademark blue uniform from 1985 to 1991, growing to be a fan favorite on and off the pitch. One of the original no. 10's of modern football, Boban was renowned for his ability to organize play, pass the ball and find space when space is hard to find. Known equally for the smile he carried on his face most of the time and his confrontational nature, he was the protagonist of one of the defining moments of the beginning of the war. 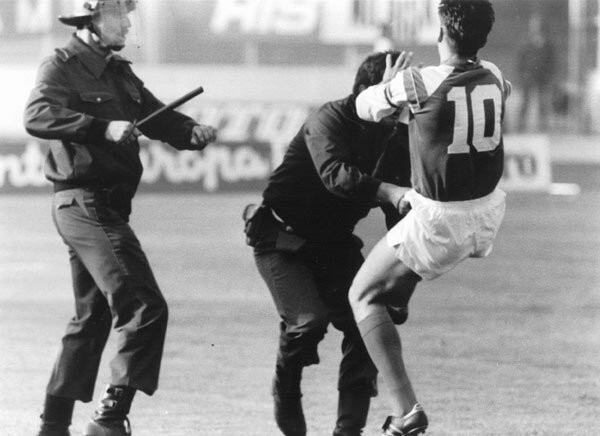 In 1991, Dinamo Zagreb was hosting Red Star Belgrade. What went on to happen was characterized in the Western media as 'the worst scenes of football hooliganism witnessed in Europe'. Thousands of hardline nationalists on both sides started to skirmish the morning of the game. The Serbian supporters were led by a group that would go on to form one of the most notorious paramilitary units in the Bosnian wars. Dinamo Zagreb's supporters weren't far behind in terms of preparedness for conflict and both sides spent the day attacking each other and the police. Violence escalated as soon as the game began, as the stadium turned into a pit in which everybody fought for his own survival. The game was abandoned after ten minutes, as Croatian supporters rushed across the pitch to confront the Serbs who were in the midst of an all-out showdown with the police and the part of the home crowd nearest to them. Most of the players had left the pitch, but not Zvonimir Boban. As the police tried to prevent Dinamo's hooligans from crossing the pitch, using clubs and batons rather liberally, Boban stepped up in protection of the hooligans. The incident infamously ended with Boban furiously fighting a group of riot cops in the middle of the pitch as chaos unraveled all around. Savicevic had his own share of controversial moments, one of which came shortly after the war, when the new Yugoslavia consisting only of Serbia and Montenegro was about to play against Croatia in Zagreb. His interview in the street quickly turned into a verbal spat when a passing man insulted Savicevic. Going back to 1991 - the ten minutes played between Dinamo and Red Star were the last ten minutes of football in the former Yugoslavia. The hooligans continued their showdown for an hour, and in the end the stadium was set on fire, making it an ominous token of what was to happen to the whole region. Boban avoided any serious repercussions but he left Croatia at the end of the season in search of better days. He found them, and he found them in Milan. 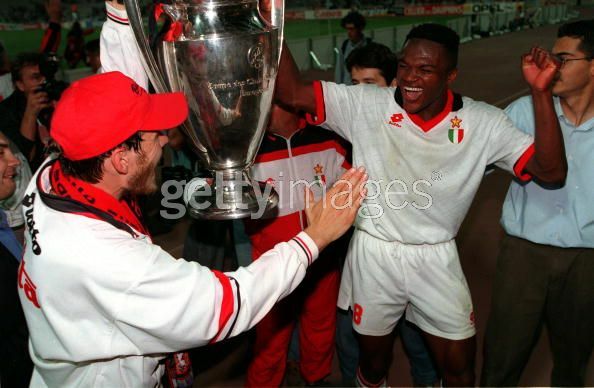 He dawned the red and black shirt from 1991 to 2001, racking up 178 appearances. He was Milan's playmaker in some of the best years the club has had, sometimes being used as a task player in other positions. Such was the case in one of Milan's most glorious games, the 1994 Champions League final against Barcelona - Boban was used on the left side of midfield, with Donadoni on the opposite flank. Savicevic partnered Massaro up front, scoring one of the finest goals of his career in the 4-0 rout. As the years passed, Boban's importance in the team declined. In 1997, Milan brought in a new trequartista who would go on to become a household name - that man was none other than Leonardo Nascimento de Araujo. Savicevic, having fallen out with coach Fabio Capello on numerous occasions and carrying several chronic injuries, effectively ended his career in the limelight in 1998, moving to a more low profile club - Rapid Wien, where he ended his career altogether in 2001. Boban ended his career in the same year, and his farewell game was a spectacular one - Milan and Dinamo fans gathered at the same stadium in Zagreb that was the scene of the infamous events of 1991 to say goodbye to one of the greatest Croatian players of all time. Savicevic went on to become the president of Montenegro's football association, and he holds that position to this day. He is regarded as responsible for bringing ex Croatian national team manager Zlatko Kranjcar to the helm of the Montenegrin team that held England to a 0-0 draw at Wembley and currently leads the qualification group with zero goals conceded in four games. After Boban retired, he decided to pursue his life-long dream of becoming a historian, and he graduated from the university of Zagreb in 2004. It has always been hard to tell whether the relationship between Boban and Savicevic was that of friendship or simply professionalism. Either way, it has to be noted that, even though both players (especially Boban) were known for both their strong political opinions and their outspokenness, they never brought those issues to the pitch or had any public confrontations...with one another. There's an anecdote about Savicevic's first days in Milan. The players were in the dressing room and Ruud Gullit came up to Savicevic who was sitting and said 'That's my seat, kid'. Savicevic casually looked up at him, turned to Boban and said 'Tell this guy this is my seat now'. Savicevic later took over Gullit's no. 10 shirt, only to have it given to none other than Boban a few years later when he had a falling out with Capello. And that's the story of two rather colorful characters that are often forgotten among younger rossoneri fans, but two players that made the difference in so many games for Milan. I hope this article succeeded in its attempt to shine some light on the personalities, lives and careers of Milan's Balkan warriors.